Our Eagles Nest walking holiday in Germany, is based in the wonderful region of Bavaria in South Germany around the great Lake Konigssee. High in the mountains overlooking the lake and famous peaks of the region is the Eagles Nest (Kehlsteinhaus); a mountaintop lodge built for Hitler’s 50th birthday. Nowadays it is a restaurant, which you can still visit and explore. On this Eagles Nest Tour you will see the idyllic, mystic and singular; the blue-green Lake Königssee which is embedded into grand mountain scenery. The mountains are very high, but there are beautiful passes to the next valleys. To see the sun rising over the steep rocks of the Stony Sea is really worth the effort. This Bavarian walking holiday starts in Berchtesgaden/Schönau a picturesque town near to the Austrian Border. If you love breathtaking scenery, then you will be blown away on this walking holiday. Our Eagles Nest walking holiday is available as a level 3 self-guided tour and also a guided based tour departing on selected dates. Own arrival to the tour start. 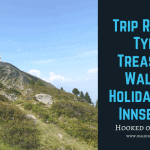 Day 3 – Walking tour up to an alpine pasture in the Grass Mountains. Downwards to the mountain village of Dienten/Hintermoos. Day 4 – Dienten/Hintermoos to the mountain hotel Muhlbach – From hut to hut to the mountain hotel. In the morning you shall take the bus up to Arthurhaus where you shall start a wonderful walking tour. You shall be walking down into the Salbach valley down the old miners path, where you will see the fantastic fortress of “Hohenwerfen”. It’s up to you if you wish to walk up the castle hill and see the bird-of-prey flight demonstrations and the collection of weapons. Afterwards by train to Golling. 13.5 km 4.5 hours walking time, up/down 120/950m. Today you begin your walking tour towards the Golling waterfall which is front of the Hoher Göll which is an impressive looking mountain massif. After this, you hike up following a walking trail through the forest to the first alpine pasture. You are now very close to the border with Germany. Afterwards you soon reach the highest scenic road in Germany. This is the Rossfeld road where you see on the left hand side the Salzach river valley, with the city of Salzburg and on the right hand side the Bavarian Alps. Here, you can take a well earned rest in the Enzian cabin to have a drink and enjoy the view. Now you descend towards the Obersalzberg, the former holiday resort of Hitler! Nowadays, you find there a permanent exhibition in the Documentation centre and the starting point for the tour up to the “Eagles Nest”! You will return by public bus to Berchtesgaden and on to Lake Königssee. 9.7 miles 15.5 km 6.5 hours walking time, 1320/90m up/down. Walks from 3 hours to 6 hours with climbs up to around 600m maximum height. Demanding walking days with tours of 3 to 6 hours to walk. You are crossing from valley to valley by using a former salt trail or walking over beautiful alpine pastures. Your trails are running close to the edge of the mountain walls and you will have spectacular views. You will walk in a low alpine area and good fitness and equipment is expected. There are public busses (going around the mountains) and you may use them to go to the next hotel (rainy days). Standard – 3 star Hotels / Guest houses / Inns. By Plane to Munich Airport or Salzburg Airport and then by bus/train to Berchtesgaden. A transfer from the finish back to Salzburg can be arranged for 1-4 persons. Please ask for details.